Petaluma roofers need to know their craft. Weather can change and having the right roofing shingle is a necessity. You need to be well trained in roofing techniques specific to Petaluma. Just being able to nail a shingle up on a roof doesnt make you a roofing contractor. Believe it or not, there are so called roofers who are barely qualified, improperly licensed and in some cases, uninsured! When a storm rips thru Petaluma, CA you need a professional roofing contractor. When you need emergency services, roof repair or inspections, NorthBay Roofing & Gutters Inc. is the Petaluma roofing contractor for the job. 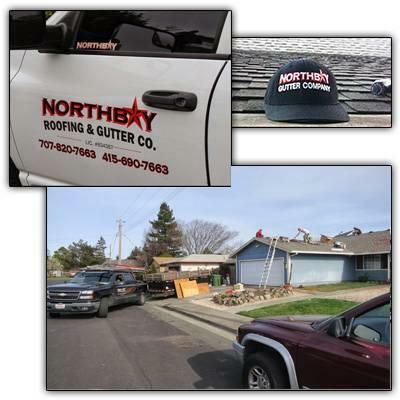 Customers in the Petaluma area, some of which may be your neighbors, have already discovered why NorthBay Roofing & Gutters Inc. is the number one choice among Petaluma roofers. Petaluma, CA residents have discovered over the years why we are the best roofer in Petaluma. Petaluma, CA area homes or businesses, call NorthBay Roofing & Gutters Inc. today at (707) 820-7663 to schedule a roof inspection and estimate.